On Friday Mary, Jacob, Kaela, and I completed what we call New Jersey's Holiday Triangle. That's when we visit Mackey's Orchard, Hot Dog Johnny's, and Wycoff's Tree Farm. You'll remember these places from past posts. Anyway, it is an annual family event, so I figured I'd make it an annual posting event. you try and order Hamburgers (not on the menu - see the name) or you try and order your hot dog with something other than mustard, ketchup, relish, onions, pickle, or some combination. You want a recession proof lunch? Here's what we got for $24 - 2 sodas, 1 birch beer in frosty mug, 3 french fries, black and white shake, and 9 hot dogs in various versions. After lunch we went to Wycoff's Tree Farm to cut down our tree. This year we got a 9 foot Douglas Fir for about $64. 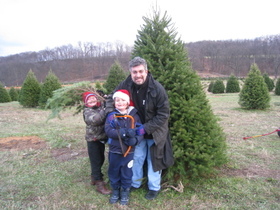 This year the kids helped me cut down the tree and helped me bring the tree to the cashier. We were told that we'll be able to drive up to the top of the hill for mountains of trees next year. After securing the tree onto the roof of our 4-Runner we went to Mackey's. This year we dropped a boat load of cash at Mackey's. The kids got free apples as long as they were new varieties which is no small feat since we love apples and have orchards within 10 minutes of our house. I grabbed a jar of Mackey's home made zucchini relish, a dozen home made apple cider donuts, and apple cider. Mary bought a Christmas Tree wreath, a bag of Papa Goes Nuts pecans, and a pine kissing ball for long hours of practice. Plus, I picked up one of these awesome 6 inch apple pies which I'm eating right now as I type this (top shelf to the left of the ribbon is the one I'm eating). 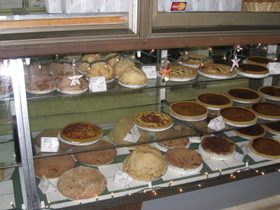 The pies at Mackey's are the BEST HOME MADE PIES YOU CAN BUY. After that we went on our way to finish decorating the house. That's New Jersey's Best Holiday Triangle and if you are within 1 hour, you should give it a go. Just make sure you tell Mackey's and Wycoff's who sent you.